Unibros was founded by Vladimir Delic in 1988 and enjoyed remarkable early growth with focus on the emerging and developing markets of the now established giants of Russia, the CIS and China. When, in the early years, bank funding was almost impossible in the CIS countries Unibros, through counter-trade, provided the mills with a full range of raw material such as coal, gas, iron ore, and equipment. In exchange Unibros took from these mills their semi and finished products which resulted in the company being one of the largest distributors of all steel products from the region on a worldwide basis. 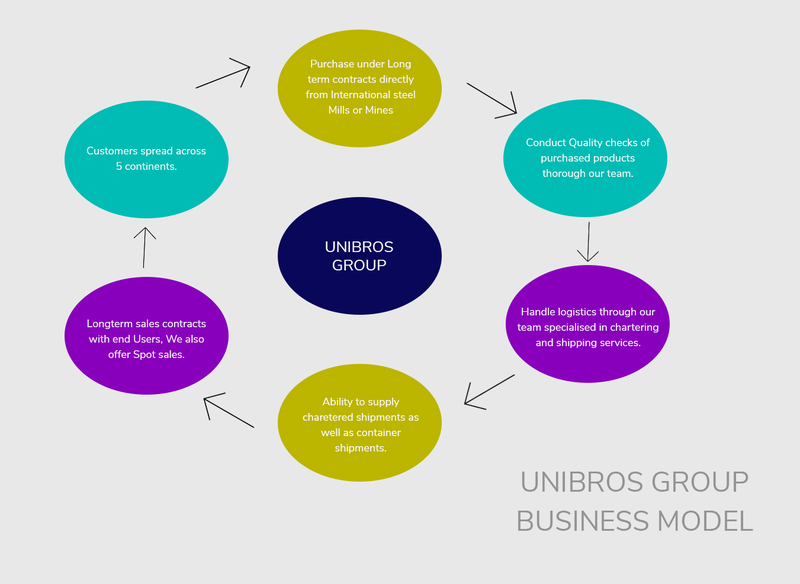 From its inception in 1988 Unibros evolved by 1994 into a group of companies encompassing sales of some $500 million and supported by some 40 offices worldwide. Unibros Steel was also one of the first companies that had sold CIS steel in China, Taiwan and countries of South East Asia and certainly a pioneer for selling Russian steel to the USA market. Following the sale of the first shipment ever of Severstal steel coils to General Motors, Vladimir Delic lead and organised a visit of Minister of Metallurgy of Russia together with General Directors of major Russian steel mills to General Motors headquarters and factories in Detroit. With the changing of the financial world in 2008 Unibros also adapted to these changes and is now concentrating of the roots of its business in the trading and shipping of Ferrous and Non-Ferrous metals capitalizing on nearly 30 years of strong relationships in this industry. From the Mine to the Mill and from the Mill to the consumer is Unibros’s commodity world. Vladimir Delic has over 40 year's experience in international trade in the private and public sector. He has specialised in commodity trading, in particular in bulk commodities and in energy resources. After graduating in Business Management and Maritime Transportation at the Universities of Croatia he joined Jugoimport in 1971 as an apprentice. In 1982 he joined General export, the largest governmental trading company in the former Yugoslavia. In 1984 he was appointed CEO of the commodities trading division for the Middle East region and based in Cairo. In 1988 Mr. Delic founded Unibros Steel, a trading and shipping company for international trade. By 1995 Mr Delic developed Unibros into one of the largest international trading houses in metals out of the Commonwealth of Independent States - CIS region with 37 offices worldwide and an annual turnover of half of billion dollars. Following his phenomenal success Mr Delic has been invited by American politicians to give several speeches to the United States business community on the subject how to enter CIS emerging market to American large companies such as Motorola, Westinghouse, British American Tobacco, Babcock to mention just a few. Due to his international experience and connections, Mr Delic was appointed as a special advisor to a number of Balkan countries to attract investment there. He represented several international companies including US Steel, Philip Morris, Otis, EnBV, Porr, Novomatic in their investments and played an integral part in attracting investment for the development of the largest Marina in the Mediterranean area, Porto Montenegro. Mr Delic is currently a member of the Board of several oil, steel and shipping companies with offices in Dubai, Hong Kong, Moscow, Singapore and Cyprus.